AUSTIN, Texas — Right-wing radio host and conspiracy theorist Alex Jones testified Wednesday that he's sincere in his "Infowars" commentary but acknowledges he also uses satire and comedy on his show. The attorney, Randall Wilhite, said during court proceedings in Austin that evaluating Jones according to his on-air comments is like judging Jack Nicholson based on his role as the Joker in "Batman." But Jones appeared to push back on that comparison, countering any suggestion that he's "playing a trick on the public." "I believe in the overall political program I am promoting of Americana and freedom," the Austin American-Statesman reported Jones as saying. He returned to the stand Thursday, at one point lashing out at his ex-wife's attorney, Bobby Newman, and saying the lawyer had "no decency. Zero." His ex-wife, Kelly Jones, is seeking sole or joint custody of their three children, ages 9, 12 and 14. The Joneses divorced in 2015 and Jones pays his ex-wife $43,000 a month. 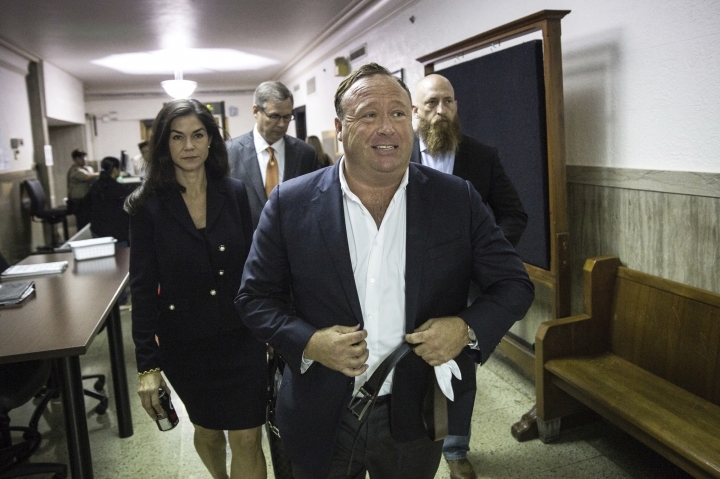 Michael Harrison, editor and publisher of Talkers, a trade magazine for the radio industry, said the trial represents far more than a child custody battle for Alex Jones. Wilhite's argument could undermine a relationship that Jones has built with his audience that's "profoundly personal," Harrison told The Associated Press. While listeners of Glenn Beck or Howard Stern may not agree with their remarks, the audience is certainly entertained, he said. Jones, by contrast, brings a level of emotion not found among many other talking heads. "You've got to believe in his message to be an Alex Jones fan," Harrison said. "That's the point. His listeners believe in him and believe that he's looking out for their benefit." Jones said in court Wednesday that his shows, which are broadcast on radio, YouTube and other platforms, reach at least 70 million people a week, the newspaper reported. One of those platforms, Infowars.com, has alleged that the Newtown, Connecticut, school shooting was a hoax and that the Sept. 11, 2001, terror attacks involved the federal government. During his presidential campaign, Donald Trump nevertheless voiced admiration for Jones, telling him: "Your reputation is amazing. I will not let you down."